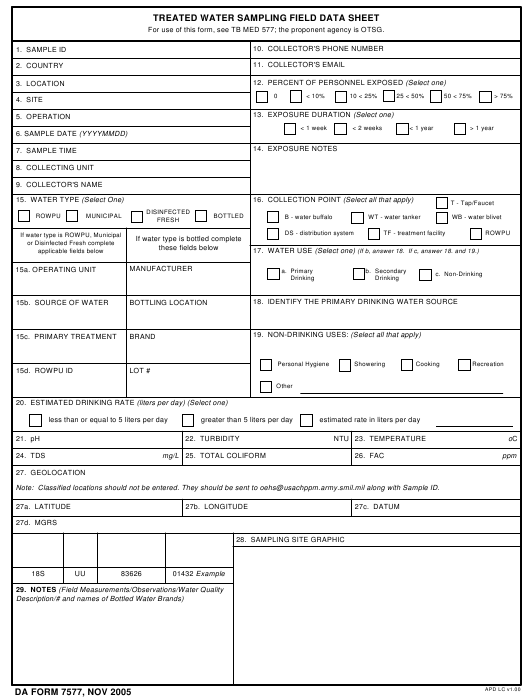 DA Form 7577 - also known as the "Treated Water Sampling Field Data Sheet" - is a Military form issued and used by the United States Department of the Army. The form - often mistakenly referred to as the DD form 7577 - was last revised on November 1, 2005. Download an up-to-date fillable PDF version of the DA 7577 below or request a copy through the chain of command. For use of this form, see TB MED 577; the proponent agency is OTSG. Note: Classified locations should not be entered. They should be sent to oehs@usachppm.army.smil.mil along with Sample ID. 1. Sample ID - Sample ID number CCC_LLLLLL_MMM_YYDDD (Sample ID should also be recorded on the sample label. Where: CCC - Country 3 letter abbreviation code. LLLLLL - Camp abbreviation (i.e. first six letters of camp name). YYDDD - jday code, last two digits of the year & three digit julian day of the year (e.g. 05015 for 15-Jan-2005). 2. Country - Country in which location or camp is located. 3. Location - Camp or location of sample. 4. Site - Specific site where sample was collected (i.e. PX, building 51, etc. ), if applicable. 5. Operation - Name of operation ongoing in the area of the sample [e.g. Operation Iraqi Freedom (OIF), etc.] if applicable. 8. Collecting Unit - Unit collecting the sample (e.g. AML, 71st MEDDET, NEMPU2 etc.). 9. Collector's Name - The name of the person collecting the sample. 10. Collector's Phone No. - The phone number of the person collecting the sample. 11. Collector's Email - The email address of the person collecting the sample (e.g. john.doe@us.army.mil). 12. Percent of Personnel Exposed - What percentage of servicemembers at the site could be exposed to the water source? 13. Exposure Duration - How long are servicemembers expected to stay at the location where the sampling is being conducted? 14. Exposure Notes - Any notes or comments related to servicemember's exposure to the sampled water. (ROWPU). Municipal - Water treated by a municipal process (e.g. coagulation, flocculation, settling, filtration, etc.). ROWPU - Reverse Osmosis Water Purification Unit. 17. Water Use - Is water used for drinking or non-drinking? [Select One. If 17.b (Secondary Drinking) is selected complete 18. If 17.c (Non-Drinking) is selected complete 18. and 19.]. 18. Identify the primary drinking water source(s): Provide description of the primary drinking water source(s). 19. Non-Drinking Uses - What are other uses of water? Select all that apply and add other uses not listed. 20. Estimated Drinking Rate - (Select One): Less than or equal to 5, greater than 5 or if known the estimated drinking rate in LPD. 21. pH - The initial pH of the water before the sample is taken or before preservatives are added, if known. 22. Turbidity - The initial turbidity of the water being sampled in NTU, obtained from on-site testing. 23. Temperature - The initial temperature of the water in degrees Celsius, obtained from on-site testing. 24. TDS - The initial total dissolve solids in milligrams per liter (mg/L), obtained from on-site testing. 25. Total Coliform - The initial total coliform count from on-site bacteriological testing. 26. FAC (free-available chlorine) - The initial FAC of the water being sampled in ppm, obtained from on-site testing. ID). 27a. Latitude - Sample latitude location in decimal degrees [from GPS]. 27b. Longitude - Sample longitude location in decimal degrees [from GPS]. 27c. Datum - Datum from map or GPS used (e.g. WGS84, etc.). 5 parts: 1) A zone, 2) latitude band, 3) MGRS square, 4) an easting, and 5) a northing (e.g. 34 T EN 12345 67890). sampling. Digital picture(s) should be sent to oehs@apg.amedd.army.mil with Sample ID. distributions system, 5) unusual circumstance, weather, potential pollution sources, etc.